Everyone was excited. They sat at their stations gathering scissors, glue, and stacks of magazine pages bearing images of fancy cars, fancier houses, and celebrity heartthrobs. The instructions were pretty simple. The vision board party host encouraged us to choose images that “represented the life we envisioned for ourselves.” No goal was too outrageous. The images, she said, were meant to inspire. Nevermind if the guy I envisioned myself with was happily married with kids or the house that I wanted cost seven figures; nothing was off limits. In between praising attendees’ creative choices, the host bragged about how the vision board had led to her becoming a first-time homeowner. “You can do it too!” she assured her gullible guests. At the end of the party, everyone gathered to take photos of themselves with their boards. And then, they were off; likely headed back to empty beds in tiny apartments, via public transportation. We’d spent $25 of our hard-earned money to be “inspired.” By the end of the party, we hadn’t received a single piece of practical advice about how to reach our goals. But at least now, we had dreams, right? I’d spent two hours listening to this host assure me that all I needed to do was follow a simple process of cutting and pasting images and my flawless future would appear. It felt like one of those classic pyramid scheme presentations where they tell you about the person who earned a Bentley and a mansion in Hawaii after participating in the program for just a few short months. Problem is, they never tell you the truth about HOW they did it. The longer you participate, the sooner you realize you’ve never seen anyone rise from your rank to the top tier level of success that the meeting host has so teasingly dangled in your face. When I talked to friends about their boards the next year, most admitted that while it was a fun exercise they had not managed to get the car, house, or handsome husband they’d pasted on their board the year prior. Yet, if you search any popular event site, you’re likely to find an array of free to high-priced workshops, parties, and extravaganzas dedicated to creating the perfect vision board. So why are vision boards still a thing? And do they work at all? The answer is yes… for some people. Those who swear by vision boards say they work because they help you seeyour success. This is true; visualization is a powerful tool on the path to change. Research has shown that visualization can lead to better physical performance and may even increase creativity. So, theoretically, it is possible to imagine your way to success. But researchers also found, when you imagine a positive outcome — as you would when creating a vision board — your brain can actually trick you into believing you’ve already achieved the goal. In turn, you become less likely to take action, and more likely to linger in the daydream phase. In my work serving as a guide to individuals and businesses at varying stages in the development of their brands, I often encounter people who have great ideas, excellent visualization skills, but very little practical execution. Much like driving without a GPS destination, they see themselves somewhere but have no idea how to get there. How then will an inspirational quote and a picture of a Ferrari bring that person any closer to actualizing their vision? Action and accountability are the only sure ways to inch closer to your goals. That’s why I ditched my vision board and embraced an accountability board instead. It’s a bit more than a to-do list, and when done properly bears many of the visualization benefits that a traditional vision board offers. Most importantly, it works. I’m not just telling you it works. I know because I tried it for the first time during a major turning point in my life. In 2009, I was an adult student returning to college to complete my undergraduate degree. In short, I was an older twenty-something-year-old sophomore. I had an abysmal 2.2 GPA from a lackluster performance during my freshman year and very little work experience. The one thing I had going for myself was a renewed sense of purpose. I was returning to college as a mom. Having just given birth to my first child, I had much deeper reasons for wanting, even needing to achieve. I wanted to do college right. This time, I wanted to take advantage of it all: every activity, every scholarship, every award, every morsel of knowledge and experience I could handle. That’s when I created my first accountability board. For me, the scripture represented a promise that if I made the effort to take practical steps toward my goals, they could be made real. It also served as a model for the perfect 3-step process to achieving any goal. I began by taking a trip to the store. I purchased a large poster board, a pack of stick-on letters, and a box of envelopes. Back at home, I lined my board with the key phrase from the scripture: Write the vision, make it plain. Then, instead of pinning pictures to my board I created a 3-step system for action. I’m a strong believer that research should be the first step in any process. 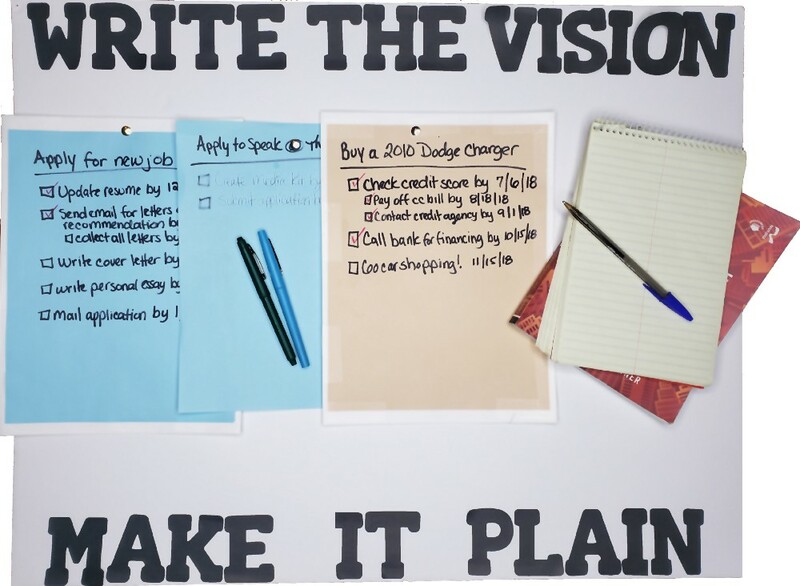 Thinking back to the vision board party, you can see how a little research might’ve spared some of my friends from visualizing a spouse who was taken or a car that was simply out of their range of affordability. I also believe there is a practical path to accomplishing almost any goal. A simple Internet search could easily reveal a blueprint to success. If, for example, you want to find a new job, you might start by searching for openings in your field. Once you’ve identified the job you want to go for, you read the application requirements closely. When you do, you learn that most employers require potential hires to submit a number of items with an application. This may include letters of recommendation, a complete list of your work experience, copies of academic transcripts, cover letters and more. This is the point where most people check out of the process. When the steps toward a goal turn out to be more difficult than we initially imagine, we tend to back down. The concept of applying for a new job may seem relatively simple. But when faced with a list of documents that need to be edited or created from scratch, many people decide it’s not worth the effort. In fact, the online employment website Career Builder found that 60 percent of job seekers don’t complete job applications if they find the process to be too long or too difficult. To move past the temptation to quit, you must be willing to embrace a delayed gratification mindset. Several psychological studies, including the renownedMarshmallow Experiment, have proven the power of resisting the temptation of immediate reward to reap a better reward later. No matter how urgent your goal seems — read: no matter how much you hate your boss and want to leave your current job — rushing through an application or quitting midway through will never get you there. But with a little patience and planning, you could land that job sooner than you think. Instead of trying to do it all at once, you have to create a schedule. Whenever I apply for a new opportunity, I start by writing a list of the application requirements on the front of a large envelope and pinning it to my accountability board. This serves as a checklist of everything I’ll need to produce in order to apply. For example, to secure a speaking engagement at a local conference I had to update my resume, create a press kit, and draft a personalized cover letter. That’s a lot to do! I knew I was very unlikely to do it all in one day with my busy schedule. So I divided the items up, assigning a realistic due date to each item based on my availability. Whenever I completed an item, I put it in the envelope and checked off the box. Completing just one item per week might be a great pace for one person, while one item per month might work better for another. Regardless of the pace you choose, you’ll likely find that incremental success can be pretty gratifying. The process of earning my goal, one step at a time, rendered multiple moments of satisfaction. Every time I checked a box, I silently applauded myself for sticking to the task at hand. This is perhaps the most important step to avoid going the same way of many traditional vision board users. Over the years, I’ve noticed that people who create vision boards often display them for a day or two before tucking them in a corner in their bedroom. If no one else knows you’ve set goals for yourself, who will hold you accountable? Better yet, if you forget your own goals, how will you hold yourself accountable? To truly see the success of an accountability board, you must display it proudly in a place where you and others will see it often. I displayed my board prominently on the outside of my bedroom door. When the door was open, everyone else in the house could see it and could question me about my progress. When the door was closed, I felt as if the list were glaring at me, begging to be attended to. I could not start my day without confronting the goals I’d set for myself. This prompted me to take action. After the of following the 3-step process and pinning opportunities to my accountability board, I’d won three scholarships totaling $16,000 and two paid internships. Ditch your vision board. Daydreaming about your goals is only meaningful when you follow with action. Create an accountability board and keep checking those boxes! Every checkmark brings you one step closer to your dream. Embrace delayed gratification as a way of life. Short term sacrifice often leads to long term gain. Engage your inner circle to hold you accountable. When you feel like you want to quit, it’s great to have someone there to nudge you back in the right direction. You can still design your accountability board, or even throw a design party if you’d like. You’ll be better prepared to take actual steps toward your goal (and you don’t have to pay anyone to get started). I’m living proof. The process works if you work it.